*** Our puppies are vet-checked and deemed healthy by our professional Veterinarian. BUYER is required to take their pup to a licensed veterinarian to be re-evaluated within 3-working days after taking possession. No replacement will be given for a returned dog that has suffered abuse or neglect. Should it be determined at this re-evaluation that the puppy is suffering from a serious life-threatening genetic condition clearly attributable to the Breeder, Buyer must notify the Breeder in writing and provide a statement of diagnosis from Buyer’s veterinarian; Breeder's veterinarian must also confirm and agree to same said condition. The puppy must be returned within 48-hrs. of confirmed diagnosis for a full refund of said puppy only, or a replacement puppy (see conditions of replacement puppy below). Buyer agrees to the Breeders terms described in the Congenital Defects and Replacement Puppy sections below. Breeder herein is committed to raising sound, healthy, loving Newfoundland's. Buyer MUST register their puppy's microchip within the first 30-days after obtaining said puppy, not doing so will VOID the Tenderheart guarantee and all promises within. __________X. **PUPPY HEALTH GUARANTEE: This contract covers the first 24-months of said puppy, from the time of whelping/birth. Breeder guarantees to the best of their knowledge, the puppy is in good health at time of sale, and will provide health records including appropriate vaccinations, worming, and health care until Buyer takes possession of pup. Buyer agrees to maintain the dog in good health at all times with exercise appropriate for this breed, food & water, current vaccinations including Rabies vaccinations given at an appropriate age (4-months), deworming, shelter, and all other needs the dog may require for a healthy environment. Buyer is responsible for any and expenses incurred with the purchase of said Newfoundland including but not limited to shipping costs, all veterinary fees, food & supplies. Newfys under 2 years of age must not be using stairs or other vigorous activities such as jumping, extended play, long walks, loading/unloading from a vehicle, etc...such activities could damage growing joints. 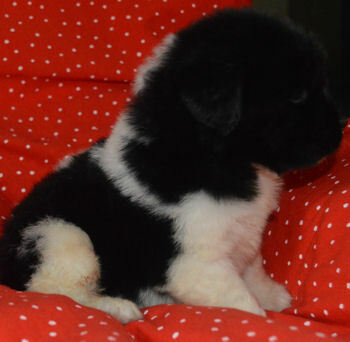 This Health Guarantee is not transferable and to apply, said Newfoundland puppy must be owned by original Buyer only. While no large canine breed carries a bloodline without risk, we have built our breeding program from carefully selected bloodlines. Buyer professionally and willfully agrees to resolve any issues with puppy and all transactions involving the said puppy with the breeder personally (with no type of online bashing of breeder) wether contract is in effect or null/void; Buyer agrees all correspondence between buyer and breeder to be limited only to the privacy and discretion of breeder and carried out in a peaceable manner. Any rudeness, defamation, or bullying of character will void this contract and can result in legal proceedings. __________X. 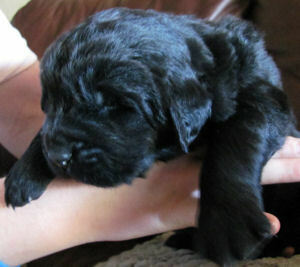 **Buyer has read Breeder’s INFO-LINKS page available on Breeder’s webpage. INFO-LINKS is a page specifically designed to provide the Buyer with information regarding the special needs of raising a large/ extra-large breed puppy, and helping the Buyer to understand their role in their puppy’s health. We do all we can to provide healthy puppies, including extensive health certifications. However, not all dysplasia and heart issues are genetic. Environmental issues play a HUGE roll in the health of your puppy. __________X. **CONGENITAL DEFECTS: Breeder guarantees the pup is not affected with Cystinuria. Breeder provides a 24-month guarantee on congenital heart defect and/or congenital vision loss due to cataracts OFA-rated severe; Buyer must notify Breeder in writing and provide a thorough veterinary statement including an official OFA-Certification rating of severe (required), in order for claim to be valid. A replacement puppy only, will be provided according to the “Conditions of Replacement” listed below, no cash/money will be given. Our guarantee covers existing severe/terminal genetic conditions, and does not cover mild/moderate which can often be environmental or undetermined; nor does it cover any large breed cosmetic condition such as cherry-eye, entropic, or dental. Breeder strictly breeds sound bloodlines which are not prone to these conditions, in order to help prevent any minor developments. __________X. **DYSPLASIA: The Breeder guarantees the puppy against severe elbow or hip dysplasia until 12-months of age. As dysplasia can be caused by a combination of genetic, nutritional, and environmental factors, it is not possible to guarantee against any dysplasia. Our guarantee covering genetic dysplasia does not include any condition of which the puppy has suffered injury, infection, abuse, trauma, or poor care/nutritional issues. Dog must be maintained at a proper weight, defined as easily palpable ribs. All joint issues/claims must have a final OFA diagnosis provided by the puppy Buyer at their cost, with an OFA rating of severe (genetic only; accident or environmental dysplasia is excluded and must be ruled out by both Buyer and Breeder’s veterinarians, in order for claim to be valid). While no large breed (regardless of bloodline) is without risk, we have carefully built our breeding program from selective health-tested bloodlines. Nu-Vet Joint Care vitamins are highly recommended but not specifically required by Breeder. Ask your vet about Nu-Vet vitamins. For your convenience, our Nu-Vet Special Order Code is #90676. Nu-Vet vitamins can be easily ordered online or by phone, Nu-Vet 1-800-474-7044. The dog must not have whelped or sired a litter after placement with the buyer. The original buyer must own the dog. Full veterinary history of pup will be provided to the Breeder, available through Certified Mail, within 7 days of claim. Buyer will also provide open communication between breeder and buyer’s vet as well. 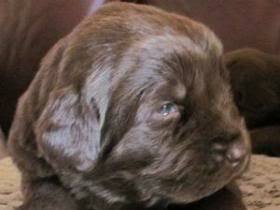 Replacement puppy will be of approximate equal quality, not limited to color, at Breeders discretion. Under no circumstances will cash/money be refunded. Replacement puppy will carry no guarantee; original guarantee is void once original pup has been replaced. If Buyer chooses to not comply with these conditions, Buyer acknowledges Tenderheart Newfoundlands will then be released from any further obligations and claims. All transportation and/or shipping costs on the replacement puppy are borne by the Buyer. Shipping costs may include, but are not limited to, Veterinary Health Certificates and vaccinations required for interstate travel, crate purchase, and actual shipping costs. The final decision to replace a puppy and the timing of such a replacement, is at the discretion of the Breeder; puppy replacements are generally expected to be fulfilled within 12-months of initial life-threatening genetic diagnosis. By not abiding by all conditions in this contract, Buyer agrees any and all further claim or transaction between Buyer and Breeder will no longer be valid. __________X. **LIMITED VS. FULL REGISTRATION: If the BREEDER is selling this puppy as a pet on an AKC Limited Registration, AKC Limited Registration may participate in accepting obedience trials, tracking tests, agility competitions, water trials and drafting tests but may not be shown in Breed competition. AKC Full Registration (breeding rights) are only offered to responsible breeders who uphold “Breed Standard” including but not limited to breed standard in size, type, temperament, and acceptable coat colors (black, brown, Landseer). Buyer will also provide complete health certifications with passing rating on all current bloodlines in their possession; missing or failed certs, or none at all, can result in a denial of breeding rights and/or purchase of new pup at Breeders discretion. Complete health certifications include: OFA Hip or PennHip, OFA Elbow, OFA Patellas, OFA Thyroid, OFA-Heart, and Cystinuria certification. Full Registration may compete in all AKC events. It is agreed and understood that any and all costs and expenses necessary to implement or perform any term, covenant or condition of this contract shall be borne solely by the Buyer. The Buyer agrees that any willful failure to adhere to this contract will result in the release of the Breeder from any and all guarantees and any further obligation under this agreement. I have read, understand and agree, to abide by the terms of this contract. This contract being posted & available online via www.tenderheartnewfoundlands.com in it's original form only, dated _______________________, and signed by both parties to assure the well-being of this Newfoundland puppy.